On this tour you will visit the beautiful village of Unterseen with its historic old town, cycle on picture-postcard like alleys along the Aare river and discover the fantastic green landscapes around Interlaken. We'll visit a farm with cows, horses and if you like you can taste some fresh milk! If you want to see more than just the shops in the center of Interlaken, you should definitely join this tour! Min. age for e-bikes according to Swiss law is 16 years. For persons below that age we provide a regular bicycle. Please note that the 2 hours tour is suitable for kids/teens, if they can pedal a bike for around 7 miles on flat terrain. For smaller kids we provide child seats, trailer, drag-along bikes etc. The tour itinerary of this tour is exact the same like the 3 hours Interlaken tour, the difference is that we omit Lake Brienz and the little village of Boenigen on this tour. If you like to see that as well, please book the 3 hours Interlaken tour. The 3 hours tour is good for teens, but rather not for kids on their own bike, as the distance of the 3 hours tour is around 11 miles. Remember: Kids and teens below 16 years can not use e-bikes. 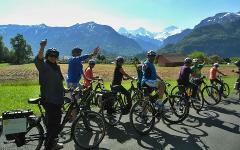 This 3 hours tour offers a unique experience of visiting the nicest spots and beautiful landscapes around Interlaken. After this tour you can say: I've seen Interlaken and it's beautiful surroundings! On this tour you will visit the beautiful village of Unterseen with its historic old town, cycle on picture-postcard like alleys along the Aare river and discover the fantastic green landscapes around Interlaken. Charge up your cameras, the blue waters of Lake Thun and emerald green waters of Lake Brienz will for sure find their way into your photo collection. BTW: if you want to know why one lake is blue and the other is green: after this tour you´ll know it! If you want to see more of Interlaken than just than the watches and souvenir shops, you should definitely join this tour! For this tour we provide you with a high-end electric bike, which makes pedaling a breeze. Min. age for e-bikes according to Swiss law is 16 years. The distance of this tour is approx. 11 miles on flat terrain. If you have kids below 16 years, you might want to check out our 2 hours Interlaken tour, which is shorter and more suitable for kids below 16 years. Teens riding a bicycle regularly are usually fine to pedal along on a normal (non-E) bicycle. A wonderful bike tour to Lauterbrunnen and into the amazing Valley of 72 Waterfalls, which is part of one of the largest nature reserves in Switzerland. High-end electric bikes with pedal assistance are incl. in the price (and much more). Already the ride towards Lauterbrunnen along the river Luetschine, which is sourced by pure glacier water, will leave its impression. But wait until we reach Lauterbrunnen, the entry to the Valley of the 72 waterfalls. We will see the Staubbach waterfall (you can walk behind it if you like! ), visit the mighty Trümmelbach Waterfalls inside the mountain, where up to 20,000 litres of water per second are thundering through the narrow gorge. For sure this visit will be an unforgettable experience. To us it´s a MUST tick-off on the bucket list for anybody visiting Switzerland. our famous Swiss picnic with local sausage, cheese specialities etc. Please be aware that this tour in NOT appropriate for kids under 16 years and for adults who are not confident riding a bicycle. A wonderful bike tour to Lauterbrunnen and into the amazing Valley of 72 Waterfalls PLUS the car-free mountain Village Murren. High-end electric bikes with pedal assistance and cable card rides are incl. in the price (and much more). 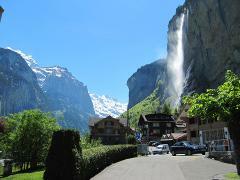 This tour is a variation of our guests favourite tour, the Lauterbrunnen 72-waterfalls-tour. But it’s much more than a copy: we have extended the wonderful tour through the Lauterbrunnen Valley and included a spectacular ride high above the Valley to the famous car-free mountain village Murren. The bike path to Murren is nearly flat with only some inclines, which are easy to ride thanks to the help of our little friend, the electric motor build into our E-Bikes. The views you have from this path are just breath-taking: see Eiger, Monch and Jungfrau mountains as if they were close enough to grab them. A wonderful ride via some unique swiss villages and along the River Lutschine leads us from Interlaken to Lauterbrunnen into the enchanting Valley of 72 Waterfalls, which is part of one of the largest nature reserves in Switzerland. There we take the cable car, which takes us and our E-Bikes up to the bike path towards Murren. Guided by unbelievable panoramic views we cycle towards Murren and optionally visit a cheese dairy, which produces AOC-certified swiss organic mountain cheese. Of course you can buy some of the cheese from the dairy. The cheese dairy visit is only possible from June to September (excat dates are weather depending and can not be predicted). Close to the cheese dairy we take a rest and enjoy our Swiss Picknick with a selection of traditional swiss specialities. Enjoy the remaining few kilometers to famous mountain village Murren with its charming old chalets and the nearby 3000 mts high Schilthorn mountain. From Stechelberg we ride to the Trummelbach Waterfalls, which will for sure make an impression on every visitor. These waterfalls are inside the mountains, up to 20,000 litres of water per second are thundering through the narrow gorge and wind down through 10 cascades before they see the light and flow on as crystal-clear mountain water stream, guiding us on our way back to Lauterbrunnen. For sure this visit will be an unforgettable experience. This tour is bookable on request. Once we receive your request we will get back to you and inform you if the tour can take place on your desired date. Join our funny and informative guided cruiser bike tour. 2 hours of exploring Interlaken in the most entertaining way! Welcome to our funny, lively and informative city cruiser bike tour. 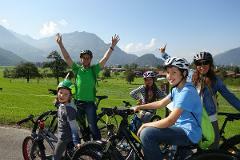 If you are new in Interlaken and would like to see the best places to eat, drink, buy local stuff or just hang out, you should join our easy cruiser bike tour! Anybody with a body height of min 5'0 feet and min age of 16 years is welcome to join. If you like a combination of fun and information this tour is just right for you. The price includes a scoop of ice cream at one of our favorite ice cream places, we'll visit some cool beer bars and give you an overview of the nicest spots in Interlaken. Included in the price are our super-stylish cruiser bicycles. Check out the photos: these bicycles are awesome! Get a reduced price of 65.- instead of 69.- CHF. Show your hostel guest card or student ID, and you'll receive the backpackers special price of 65.- CHF. This tour IS NOT appropriate for families with kids below 16 years.